Dr. Richard Dumas & Dr. Emery Ward - World Class SMILES!! Dover Dentist, Dr. Silvio Balzano & Dr. Richard Dumas are dental professionals dedicated to General, Family & Cosmetic Dentistry such as Dental Exams, Cleanings, X-rays, Fluoride, Dental Makeovers, Teeth Whitening, Veneers, Crowns, & more. 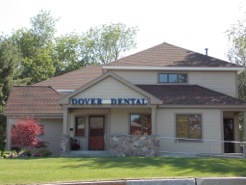 Please come and visit Dover, NH dentist Dover Dental Associates.